Camping is one leisure activity that no one can deny to like. One of the most amazing outdoor activities, camping is creative too. On one side It teaches us how to survive in the least of the resources and on the other, there is no fun equivalent to camping, it has its own fun. You could bring all the camping pleasure to your wall with camping wall art where you could get amazing camping themed wall decals. The is a huge variety of vinyl camping decals that could set the camping mood permanently on your wall. 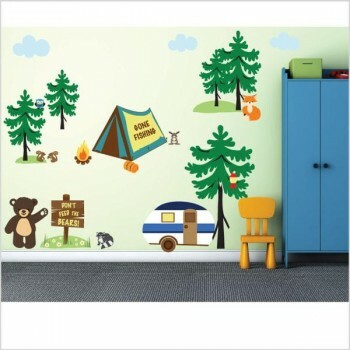 The camping decals are a style of vinyl wall art which makes them easy to remove. The designs could be as subtle as symbolic, as simple as outline figure or as heavy as a whole campsite. If you think camping themed wall decor is only for kids, you are surely wrong. If you can go the extra mile and wish to share your love for camping you could get some amazing designs which are not at all kiddish. A quote, a collage of words, a collage of words forming a shape of something or simply a one-figure black decal of probably a camper or an accessory, could be some amazing choices. Camping stickers or camper wall decals are a perfect way to decorate your kids’ rooms too. Children love sceneries and they would love to see their walls with images of caravans, tents, trees, and whatnot. The best thing about vinyl wall art is, it can be customized. As a camper you might love one thing that you like the most about camping, you just need to tell us and we will get it on a decal for you. And you don’t have to worry about it changing it, if you get bored of it, we would simply make a new one for you. These wall decals are easy to remove and do not leave any stain.